The Durham Geo M-Logger is used to monitor Slope Indicator MEMS sensors. The M-Logge is also compatible with EL-SC sensors. Simple to use and economical to deploy, M-Loggers can be placed close to sensors, enhancing reliability and keeping cable costs down. When the M-Logger is equipped with wireless communications modules, data can be retireved automatically and forwarded to a web-based monitoring site, such as Atlas. Top-of-hole monitoring of in-place inclinometer sensors. Local monitoring of beam sensors and track sensors. Monitoring in areas where heavy traffic or electrical noise make short signal cables necessary. 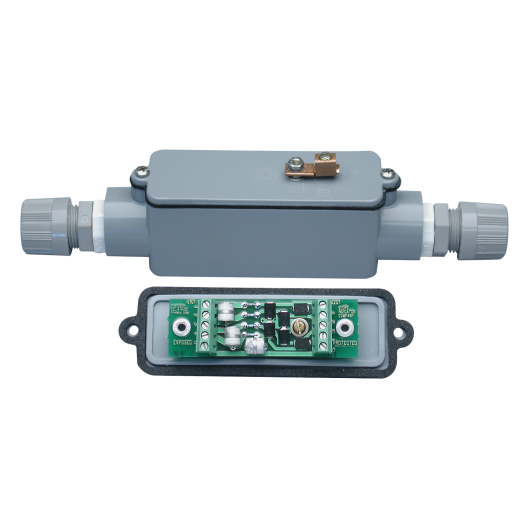 Monitoring sensors that are too far apart to connect to a centralized data acquisition system. Simple Setup: M-Loggers are very easy to configure. The user enters a list of sensors, sets a start time, and specifies a logging interval. After that, the logger is ready for work. Cost-Effective: M-Loggers are a cost-effective alternative to centralized data acquisition systems. Local deployment of the logger eliminates the cost of installing and protecting long runs of cable. Spreadsheet Friendly: CSV files from the logger are ready for import, with dates and numbers formatted to the regional settings in Windows. Wireless Data Retrieval: Manager software makes wireless data retrieval easy and automatic. Of course, data can also be retrieved by direct connection. Push to Web: Manager software can sorward data files to a web-based monitoring site, such as Atlas, for automated processing. Automation-Ready: Data formats for automatic processing include the Campbell Scientific table format and the Slope Indicator ID format. 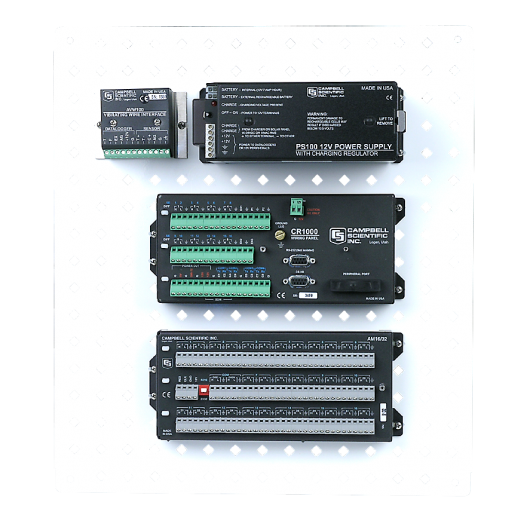 Each logger can monitor a chain of 16 serial sensors, or one multiplexer with 16 standard sensors, or one standard sensor connected directly. The logger is powered by a 12 V battery. Longterm deployment or wireless communications normally requried a charging regulator and power source such as an AC adaptor or solar panel. These include point-to-point radios, cell modems, and Wi-Fi radios. Manager software for Windows is included with the logger. The software is used for setups and for retrieving data. It offers scheduled, automatic data retrieval and cann push data files to specified internet addresses as well as storing files locally. 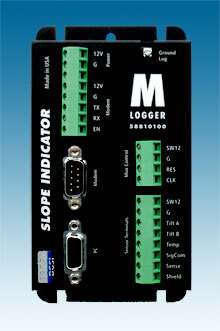 Please download the datasheet and the manual for the M-Logger. These documents can be viewed and printed with Adobe Acrobat Reader. Connection of multiple standard sensor requires a multiplexer and a terminal board. The terminal board is used to connect power wires from multiple sensors. Note that the multiplexer option is not needed when serial sensors are connected to the logger. A battery and battery bracket are normally ordered with every system. A 12V 7ah battery can power an M-Logger taking hourly readings for about 140 days. For longer term deployment , the charging regulator and a power source are required. The power source can be an AC charger or a solar panel. The AC charger includes various wall plugs. The solar panel includes hardware for mounting on pole. Small Enclosure 56705005 The small enclosure is suitable for systems that monitor serial sensors or a single standard sensor. Dimensions are 305 x 356 mm (12 x 14"). Medium Enclosure 56705010 The medium enclosure is required for systems with a multiplexer. Dimensions are 356 x 406mm (14 x 16"). System Assembly 96700005 The system assembly charge is required when components are mounted in the enclosures at the factory. Weatherproof enclosures are required for outdoor applications. These strong fiberglass enclosures provide an internal panel for mounting components, an external grounding lug, and an opening for cable entry.